It was a celebration after their KXIP's win over the Delhi Capitals. The Indian Premier League (IPL) brings a lot of travelling and a hectic schedule with it. It is the association of close to 22-23 players in a team for almost two months and they become great friends during this period. A win in any match demands for a celebration and the same was done by the Kings XI Punjab (KXIP) after their come from behind victory over the Delhi Capitals on April 1. Sam Curran took a sensational hat-trick and was also one of the reasons to trigger a huge collapse of the opposition. The Capitals lost seven wickets for just eight runs in 16 balls to lose the game by 14 runs. At one stage, it was a cakewalk for them in the run-chase but the Kings XI won the game from nowhere and it called for a celebration post the proceedings in the middle. Upon reaching the hotel, the team got together to cut the cake and Sam Curran was the man of the moment for his hat-trick. Even the team’s co-owner and the Bollywood star Preity Zinta joined them while also warning that the cake shouldn’t be wasted. 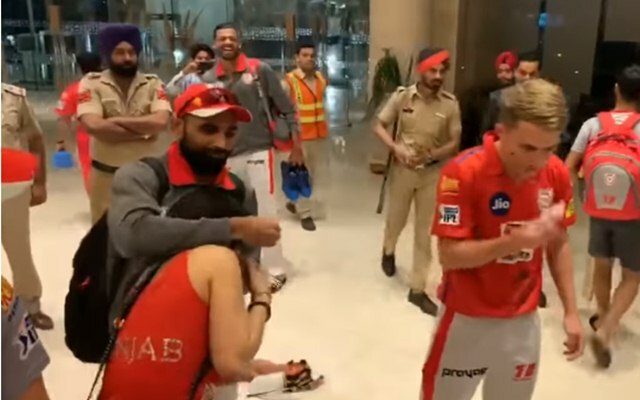 The cake was cut as the applause followed for the England cricketer and despite the instructions, the KXIP players applied cake on Sam Curran’s face. During that period, Mohammed Shami, who also played a crucial role in the team’s victory, tried to put the cake on Preity Zinta’s face which the actress avoided. She tried to get away from him and instructed him not to do that to her. “Please don’t do that…don’t do that…Shami don’t that, ” she was heard telling Shami in the video. The celebrations continued even after the KXIP players created a huddle and started singing possibly the theme song of the franchise.